The Valencia Round Dining Table can seat up to six people which makes it perfect for intimate gatherings. Made from solid pine and hand distressed in an antiqued white finish, this table is durable but the with patina of a well-loved antique. The vintage feel of this table is enhanced by the hand-carved details of its base and the grain detail highlighted in the wood. 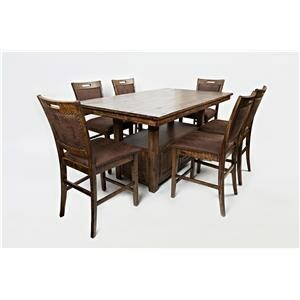 Six upholstered side chairs are included in this set, each featuring durable chair construction joinery and hand tufting, which offers great value and beautiful look to entire dining set. 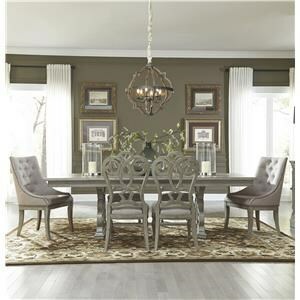 The Valencia Round Pedestal Dining Table & 6 Upholstered Side Chairs by International Furniture Direct at Great American Home Store in the Memphis, TN, Southaven, MS area. Product availability may vary. Contact us for the most current availability on this product. Browse other items in the Valencia collection from Great American Home Store in the Memphis, TN, Southaven, MS area.